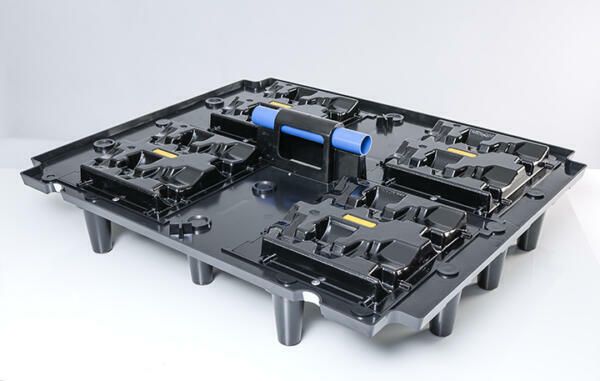 Thermotec Plastics has just introduced a new crank tray for Jaguar Land Rover. This has an innovative hybrid design that utilises vacuum forming for flexibility and injection moulding for repeatability and robustness. Based on the customer’s changing needs Thermotec, who specialises in vacuum formed parts, partnered with local injection moulding company Glendenning Plastics Ltd. They jointly developed a solution that future proofs design changes in customer components by allowing the less expensive, vacuum form option to be removed and replaced. This was as an alternative to re-tooling and re-designing the expensive injection moulded element for subsequently evolving parts. The product is being handled using a sophisticated ‘pick and place’ robotic system with an integrated vision system. Parts are correctly orientated through the identification of specific indicators. From paper concept to initial production was only a ten week process, with the time-frame for subsequent changes expected to be further shortened to just five weeks. The whole of this Midlands based project, from design, to tooling and manufacturing has been completed within a fifty mile radius.